Roma began bellydancing in 2003. She was immediately drawn to tribal style after seeing a duet performed in perfect synchronicity without any choreography. She took classes at Domba studios in Tempe, AZ. When she moved to Maryland in 2005 she joined local troupes and began performing all over the Delmarva Peninsula. She continued to train with DVD's and workshops with other tribal dancers. 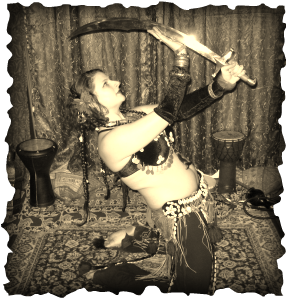 She began teaching tribal style bellydance in 2007 at the Art Institute & Gallery. The troupe, Nomadic Magic, was formed soon after classes began. In 2009, the group began performing monthly at Namaste Indian Cuisine in Salisbury, MD through 2011. Roma is a Gypsy Caravan certified Collective Soul instructor (2009). She teaches tribal improv classes with 4 different levels according to the large vocabulary of moves, cues, layers, turns, combos, and variations. She also teaches themed workshops and drills classes. Since 2011, Roma has performed primarily as a soloist to live music by Wine and Alchemy and Circa Paleo at Maryland and Pennsylvania Renaissance festivals. She describes her style as ecclectic, old world, sultry and original. Her style continues to grow and be defined. In 2014 Roma obtained her Kripalu yoga certification and began teaching at Soul Yoga Studio.